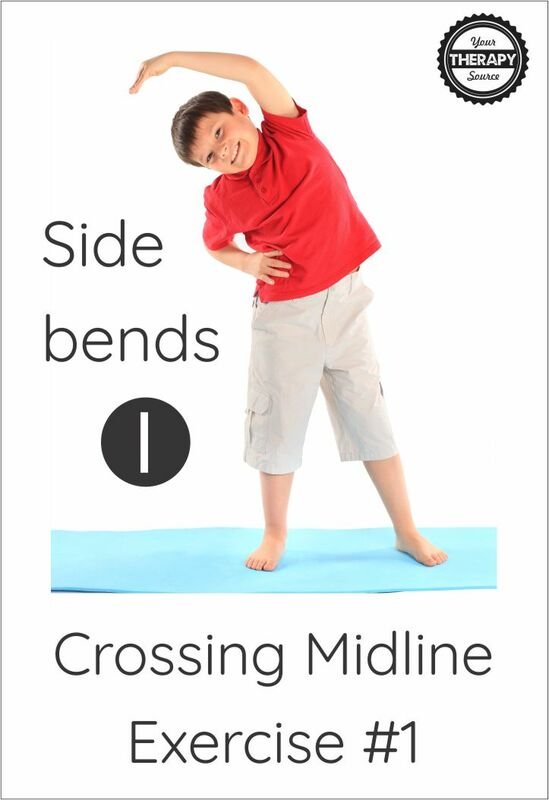 Do you work with students who have a difficult time crossing midline? Perhaps they experience visual spatial issues? 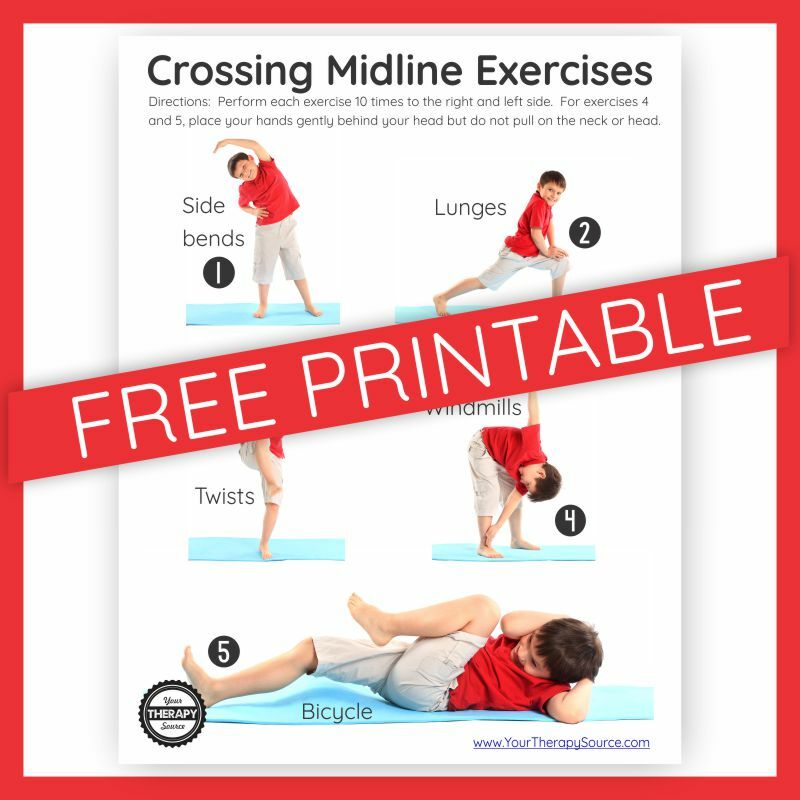 These crossing midline exercises can not only help children crossing from left to right or right to left, they also encourage bilateral coordination skills, balance and strengthening. You can perform this exercise in standing or sitting. Place left hand over your head and bend your trunk slightly to the right. Hold for 3 seconds. Switch and place your right have over your head and bend your trunk slightly to the left. Hold for 3 seconds. Repeat 10 times to each side. 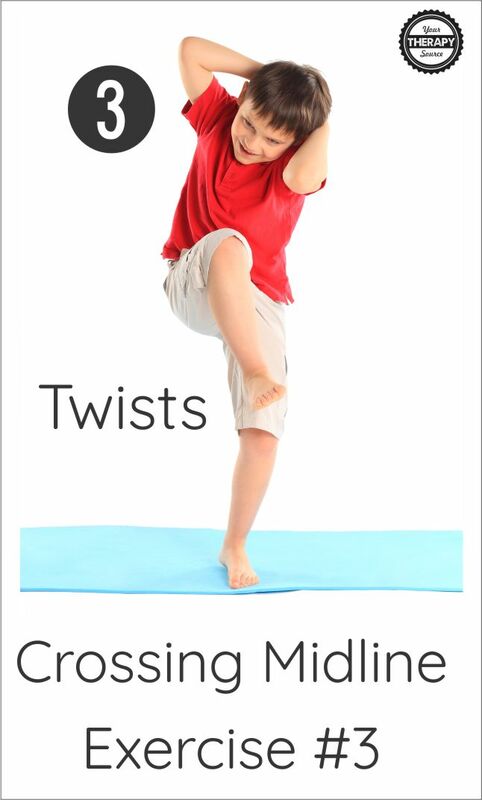 Place the left foot to the left side, place BOTH of your hands on the left knee and bend the knee to about 90 degrees. Hold for 3 seconds. Repeat 10 times to the left. Perform on the right side 10 times. For this exercise, the child stands up (or you can do in sitting). Gently place both hands behind the head. Without pulling on the head and neck, bring the left elbow to the right knee and back up to upright standing. Then bring the right elbow to the left knee and back up to upright standing. Repeat for a count of 10 to each side. 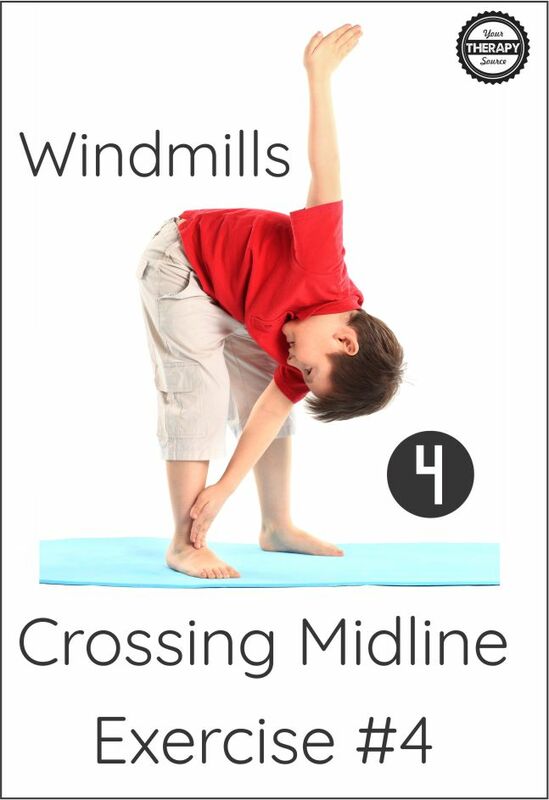 Most children are familiar with windmills from physical education class. Stand up tall and bring your right hand to the left foot. Return to upright standing. Then bring your left hand to the right foot. Return to upright standing. Repeat 10 times to each side. 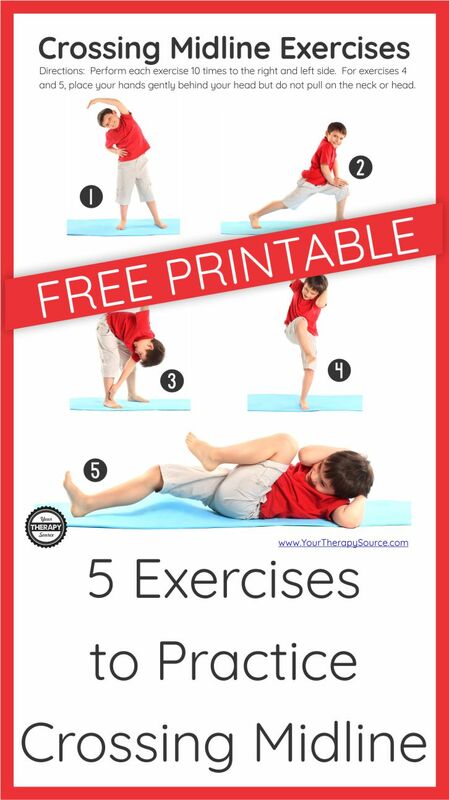 This is another exercises that many children will be familiar with from gym class. Laying down on the floor, gently place your hands behind your head. Bring the left elbow to the right knee and put your head back on the mat. Then bring your right elbow to the left knee. Put your head back on the mat. Repeat 10 times to each side. DO NOT pull on your head and neck. Your hands are just supporting your head. 25+ Bilateral Coordination Exercises is a collection of bilateral coordination exercise sheets including QR codes with links to the video demonstration of exercises. A QR code is a black and white image with squares, that stores website links for reading by the camera on a smartphone.Each exercise page includes picture images and step by step directions of a whole body bilateral coordination exercise. Also included, is a link to a You Tube video with a demonstration of the exercise along with a slow motion video of the exercise. Parents, students or teachers can simply use a QR code reader app on their smart phone or tablet to go directly to the video demonstration. These activities encourage bilateral coordination, motor timing, motor planning, muscle strengthening and balance skills. FIND OUT MORE. Sign up to receive the weekly email newsletter and announcements from Your Therapy Source. You will get a link to download the FREE PRINTABLE. If you are already a subscriber, please enter your email and you will be redirected to the link.